Many attorneys are surprised when, a year after buying their first malpractice insurance policy, their renewal pre-mium rises 20% – 30%, even though there was no material change in their practice, and they didn’t incur a claim. This post will explain why that hap-pens, not just at the first renewal, but also at the second, third, and fourth. One of the least understood aspects of claims-made insurance policies is ‘step-rating’, which insurers implemented in recognition of the fact that there’s usually a lag of several years between the time an attorney commits an error and the time the client makes a claim. Step-rating allows insurers to match the premium they charge to the risk of a claim being made. With step-rating, the premium is relatively in low the first year of a claims-made policy, i.e., a firm’s first year of coverage, because there’s little risk that the insurer will have to make a payout, i.e., little risk that attorney will handle a case and make an error and have the client file a claim all during the one-year policy period. After the first year, the premium increases in each of the next four years, to match the increasing risk that the insurer will have to make payment, i.e., that the firm will incur a claim. This increased risk is due to the firm’s increasing “prior acts” coverage, which is coverage for malpractice claims that arise out of work done prior to the current policy period. The first policy that a firm buys – Year 1 – has no prior acts coverage, i.e., no coverage for work it did before the policy’s inception date. When the policy renews in Year 2, it’ll provide one year of prior acts coverage, i.e., for work done in Year 1; in Year 3, the policy will provide two years of prior acts coverage, etc. Example: solo practitioner Smith’s first policy will have no prior acts coverage, i.e., it won’t cover claims arising out of work Smith did before that policy’s inception date – 5/4/16, if the first policy took effect today (Smith is self-insured for any work he/she did as a solo prior to buying coverage). When the policy renews on 5/4/17, Smith will have one year of prior acts coverage, back to 5/4/16. When it renews on 5/4/18, Smith will have two years of prior acts coverage, and so on. The premium increases in each year to reflect that increasing prior acts coverage. 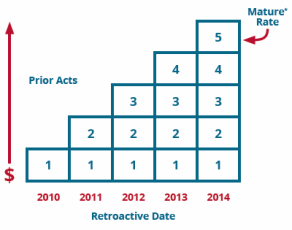 These ‘step-rating’ increases stop after Year 5 of coverage, because an attorney’s exposure to malpractice claims arising out of prior acts stops increasing, as the statute of limitations tolls on cases from three and four years ago, which offsets the risk of a claim arising out of more recent cases. Thus, an attorney’s risk of incurring a malpractice claim remains more or less constant after Year 5, which obviates the need – or justification – for the insurer to apply further step-rating increases. In other words, insurers have concluded that all other factors being equal, an attorney with, say, 30 years of prior acts coverage, has about the same risk of incurring a malpractice claim as an attorney with six years of prior acts coverage, i.e., very low, because few malpractice claims are filed 6 – 30 years after an attorney makes an error. Here, the Year 1 premium is 50% of the “ultimate” step-rating premium, i.e., a 50% dis-count, which is reduced each year, as the attorney’s prior acts coverage increases. The elimination of the discount over five years accounts for doubling of the premium. As noted, the premium increases stop after Year 5, because the attorney’s prior acts exposure reaches equilibrium, i.e., each additional year of prior acts coverage doesn’t increase the risk that the atty. will incur a malpractice claim arising out of his/her “prior acts”. Note: each insurer uses different step-rating factors, which may differ from those shown above, such that the premium may more than double over five years. Further, some insurers spread the increases out over six or seven years. However, most insurers’ step-rating increases will cause a firm’s premium to at least double over the first 5 – 6 years that it buys coverage, independent of other factors that affect the premium, i.e., additions or subtractions to the attorney roster, the policy limits and deductible, the firm’s practice areas, revenues, claims history, etc., and macroeconomic factors, such as inflation and interest rates. Also, keep in mind that most insurers calculate a premium for each of the firm’s attorneys and a premium for the firm, and blend them to get the final premium. While step-rating applies to all attorneys, solo practitioners buying their first malpractice policy will especially notice the increases, particularly in the first three years (Steps 2 – 4), when the increases are larger and the base premium is smaller, but won’t be affected by them again after five years, i.e., once they’re considered to be “mature”. Conversely, a multi-lawyer firm will experience a step-rating increase in its premium for each attorney who’s in year 2 – 5 with the firm. Therefore, if it adds new hires every year, it’ll incur a step-rating increase every year, since barring the sudden departure of all of its recent hires, at least one of its attorneys will always be in year 2 – 5 of his/her tenure with the firm. However, if most of the firm’s attorneys are “mature”, and thus not subject to a step-rating increase, then the step-rating increase it does incur may not be noticeable amid the other factors that affect the premium. So, if you’re a solo practitioner, expect a 20% – 30% increase in your malpractice insur-ance premium in each of the first five or six consecutive years that you’re covered, solely due to step-rating, although as noted, your actual premium may increase more or less than that if your practice areas, policy limits, etc., change. If you’re an owner of a multi-lawyer firm, expect a step-rating increase in your premium in any year in which your roster includes one or more attorneys who’ve been with the firm for less than six years, although it’s effect will be diluted by your “mature” attorneys, i.e., those who don’t receive a step-rating increase. You can see a visual representation of step-rating in the diagram at the top of the page. The premium increases each year in years 2 – 5, as the prior acts exposure increases. The Retroactive Date, which is the inception date of the first malpractice policy the firm purchased and has renewed each year without interruption, never changes, but the prior acts coverage increases by one year each year the policy is renewed. As noted, that drives the premium increase in years 2 – 5. As also noted, step-rating increases stop after five years, because the risk of incurring a claim levels off, as the SOL tolls on older matters. Your legal malpractice policy has a Retroactive Date for the firm, and for each attorney the firm subsequently hired. The Retroactive Date for the firm and every attorney who’s with it on the day it buys its first malpractice policy, is the inception date of that policy, as long as it renews it without interruption. For all attorneys hired after that, it’s their date of hire. Your insurer uses these dates to calculate any applicable step-rating increase when it determines your firm’s renewal premium. Keep in mind that if your firm switches malpractice insurers, it’ll lose all of its prior acts coverage, unless the new insurer offers it the same Retroactive Date that’s its prior insurer did. Insurers do this routinely, because otherwise firms wouldn’t switch insur-ers, but your firm needs to make sure that its new insurer does so. Finally, consider increasing your firm’s policy limits as its Prior Acts exposure increases, i.e., when you renew your policy for Year 3. This is especially important if you chose a minimum limit policy in Year 1, as your firm will have ‘outgrown’ it by Year 3.